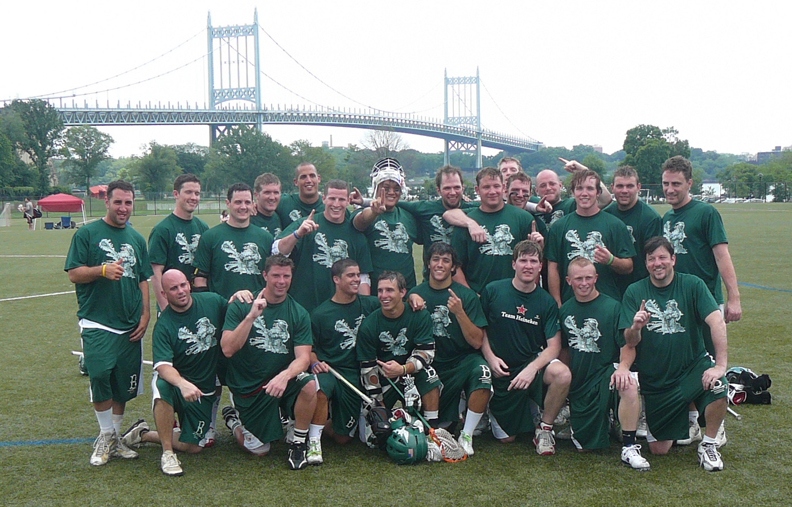 When the list of summer tournaments came to the administrators of the Brooklyn Lacrosse Club, Matt Ossola and myself decided to take the local one right away – the 2011 Salt Shakerz Invitational, here in Randall’s Island, in our hometown of New York City. Before the A.L.L. club season ended, we paid the tournament entry fee securing a spot to compete. The great part of being an underdog, if carefully done, is gaining the element of surprise. We wanted to get the RIGHT players we could possibly acquire, to produce the BEST team possible, in order to WIN. Funny how that quote came from an actor/comedian that is best known for his role on The Cosby Show, about a family living in Brooklyn, NY. But that quote meant we could not be democratic and take everybody on our active roster because not all had the right tools and capabilities to win a multi-game tournament. We had to be VERY honest and selective, eventually disappointing some players who were not asked. The little things DO COUNT. Matt and I went on the hunt and exhausted our network of lacrosse players we knew who could reach out for the specific talent. 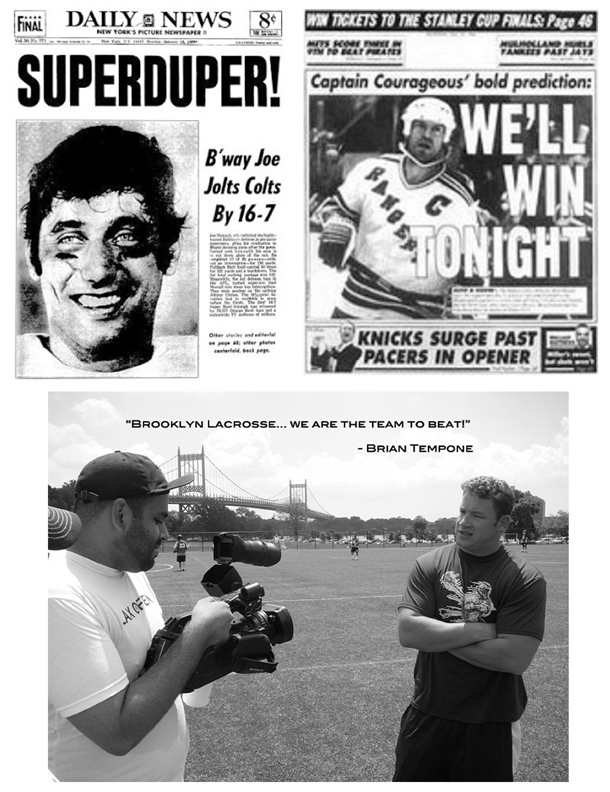 The help of our teammate, Brian Tempone (Nassau CC/Loyola/MLL-Barrage), we managed to uncover the roles. We did not want an elite team of the best lacrosse resumes, rather a combination of youth in recent high-school grads, current collegiates and experience with a variety of post-collegiate names. The variety enabled us to have offensive firepower with ball control, stubborn yet intelligent defense, “blue collar/lunch-pailers” and “grinders/scrappers” with “iron-man” capabilities. Compliment that with specialized roles in long-stick middies, 3 excellent face-off men (all who could play both offense and defense – no FOGO’s) and two goalies; one lefty, one righty. Of the 26 names listed above, 12 were from the current Brooklyn spring roster in the American Lacrosse League. Our uniforms were going to be very straightforward and NOT flashy. 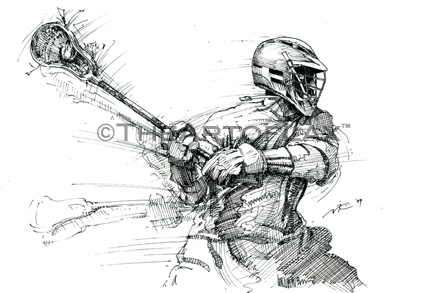 The “Crank” image from The Art of Lax™ portfolio was chosen to be screened on a shooter-shirt with the Brooklyn Lacrosse logo on the back, as well as on the shorts, both products on Power-Tek Performance Gear material. 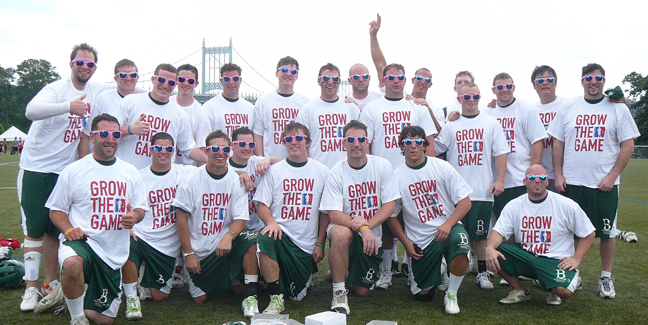 The Brooklyn Lacrosse/The Art of Lax™ priority was to compete in a lacrosse tournament–not a fashion show. Day One. Saturday, June 25th. 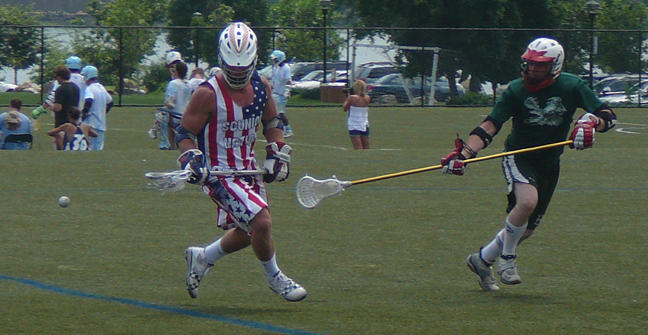 During the 1st day of the tournament, we bolted past the “CityLax/Hudsons LC” by a score of 17-1. We knew that the talent would get tougher as the day went by with our next opponent, a team hailing from California called “Xiphos”. After a little see-saw action in the first half, we cruised by them 11-3. By the end of the day, we played “NYC Summer Lax Camps” and finished with a score of 8-4 and an invite for the next day consisting of the semi-final and championship games. During the down time of the 1st day, we heard of and observed another team that was annihilating their competition left and right, with hefty scores going into their respective half-times. This team was called “Scunion Nation” that was made up of current Div. 1 players from; Army, Denver, UMass, Villanova, UPenn, among others. They were VERY good and of all the teams in the tournament, wore the BEST uniforms. It was clear that this was the team to beat. Day Two. Sunday, June 26th. Semi-final & Championship games. When Matt & I were building this team, we mentioned to each other that we would be happy with a 2-1 record after day one, but we were going into the Final Four of the tournament with a perfect record of 3-0. We got a lot of high-brow surprises from other spectators as our plan to create a very competitive team showed. We opened up in the semi-final against “Team Lagunitas” and found ourselves tied at 4 at half-time. We adjusted our plan, and put our “iron-men” players in to take the air out of the ball, thus tired out the competition and passed the ball to our scorers. Final score was 9-6 in favor of Brooklyn Lacrosse/The Art of Lax™ and a chance to take the title. How man people get an opportunity to do something great, or go above and beyond their expectations? In the other semi-final game, “Scunion Nation” had a 4-0 lead before their opponent, (“LI Squids”) got their first possession of the ball. We asked around who were their “go-to players” and were told that current Army player, Garrett Thul, was their prime scorer. Our close-defenseman, Hunter Greene (SUNY-Stony Brook), was given the assignment to guard him. A few referees and players from the “LI Squids” gave us their scout on Thul and “Scunion Nation’s” stand-out players. The 15-minute break in-between the semi-final and championship game gave us time to devise a plan. “Scunion Nation” opened up the scoring but that didn’t seem to faze us, rather get us going. It was Joe Garvey’s (RPI) turn to start in goal and he did a great job commanding the defense, which suffocated “Scunion Nation’s” offense and frustrating Thul with constant doubling, who couldn’t get his favorite outside shots on cage. Nick Ferrerio (Holy Trinity/NYiT) dominated on face-offs! Our offense on the otherhand, moved the ball very well with extreme patience, getting the shots in. 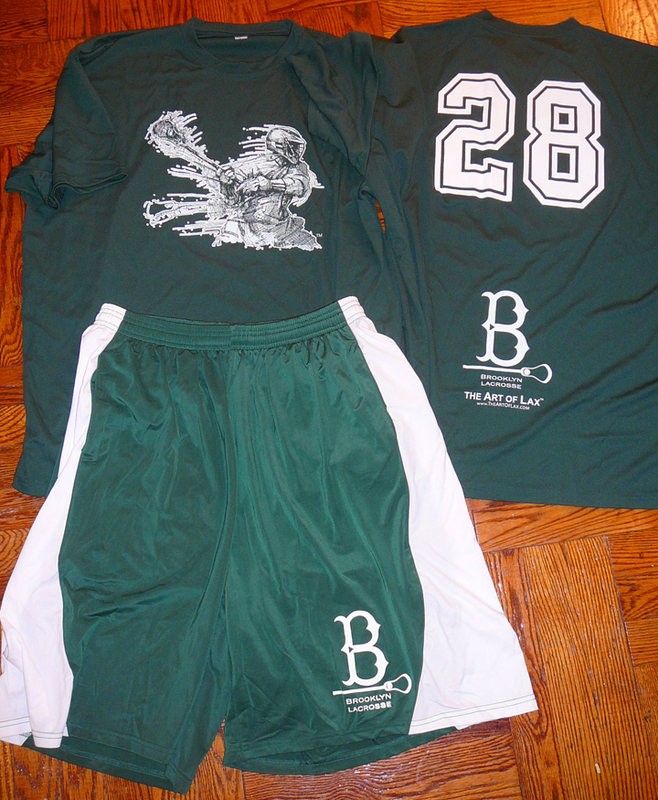 At half-time the score was 6-1 in favor of Brooklyn Lacrosse/The Art of Lax™. This was for sure uncharted territory for both teams in their own respective reputations. Garrett Thul (Army) being watched by Hunter Greene (SUNY-Stony Brook). We realized that Thul, being a lefty shooter, did NOT like shooting on a lefty goalie. As much as I wanted to play, I decided to NOT step in the goal for the 2nd half, rather to play the role as coach on the sideline – directing the right players, at the right times. I wanted to win this championship by NOT ruining any continuity, and I felt that my role as a coach, was my contributing strength at that specific moment. The 2nd half showed a great amount of urgency and competition from both sides and at the closing whistle, the score was 10-6 in favor of Brooklyn Lacrosse/The Art of Lax™. Championship won! 5-0, the PERFECT record! Playing sports reveals one’s character but it teaches you to be REALISTIC with things, especially with the PREPARATION. Just like a business, one can not be one-dimensional, you got to have the horses! Everybody on the team knew their specific strengths/weaknesses and their roles/responsibilities. We had utmost respect for all our opponents, by first, having utmost respect with ourselves and each other. Surprisingly, there were NO conflicts on the field, and everybody got along extremely well. I think that was the underlying strength with this team, besides the variety of talent. As an end result, we increased our network of lacrosse talent for future competitions down the road. I personally do not like to hear or use the word PERFECT, but did I think two months prior to the tournament we would be this perfect with a 5-0 record?… absolutely not! For a team name with a competitive history and an average reputation overall, we surprised others… as well as ourselves. We created a perfect storm. During the downtime in between games of the 1st day of competition, a video crew was going around interviewing team leaders. After my interview, I told them to “fake-film” an interview with our own, Brian Tempone, as a joke. Brian gave a brief background of himself and made a closing statement: “Brooklyn Lacrosse… we are the team to BEAT!” I think hearing those words woke us up. Too bad the video crew NEVER pressed the record button. Brian Tempone, of Merrick, LI. Joining the ranks with distinghuished New York-based athletes who have made such statements before!